An important Great Lakes Map showing the straits between Lake Superior, Lake Huron, and Lake Michigan. Carte du Detroit entre le Lac Superieur et le Lac Huron, ave le Sault Sainte Marie et la Poste de Michillimakinac, Dresse sur les Manuscrits du Depot des Cartes et Plans de la Marine. This is a fine example of Bellin's scarce 1744 map illustrating the straits between Lake Superior, Lake Huron, and Lake Michigan. 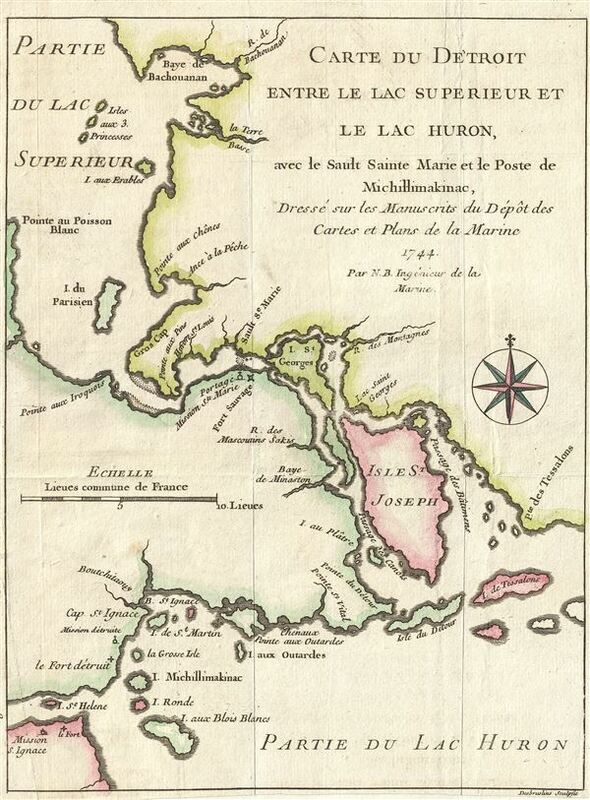 The map covers from Batchawana Bay (Baye de Bachouanan) south to Whitefish Bay past Ille Parisienne to the St. Mary's River, which it follows inland, passing the Mission of St. Marie, Fort Sauvage, and Surgar Island (I. St. Georges) to the Isle St. Joseph and Lake Huron. It then follows westward as far as Bois Blanc Island and Point St. Ignace and the entrance to Lake Michigan. This is the same passage through which the United States-Canada border now runs. Bellin originally prepared this map to illustrate Pierre François Xavier de Charlevoix's Histoire et description generale de la Nouvelle France. It was engraved by Desbruslins Fils of Paris. Charlevoix's history thus proved exceptionally influential as one of the most comprehensive works on North America predating the French and Indian War. Copies of the Histoire et description generale were to be found in the libraries of many 18th century luminaries, including Voltaire, Franklin, and Jefferson. Jefferson especially admired Charlevoix work, calling it 'a particularly useful species of reading' and no doubt influenced his decision to pursue the historic 1802 Louisiana Purchase, possibly the most significant event in the post-colonial history of North America. Very good. Margins narrow. Original fold lines exhibit minor wear. Blank on verso. Kershaw, K. A., Early Printed Maps of Canada, no. 945. Sabin, J., A dictionary of books relating to America: from its discovery to the present time, 12136.